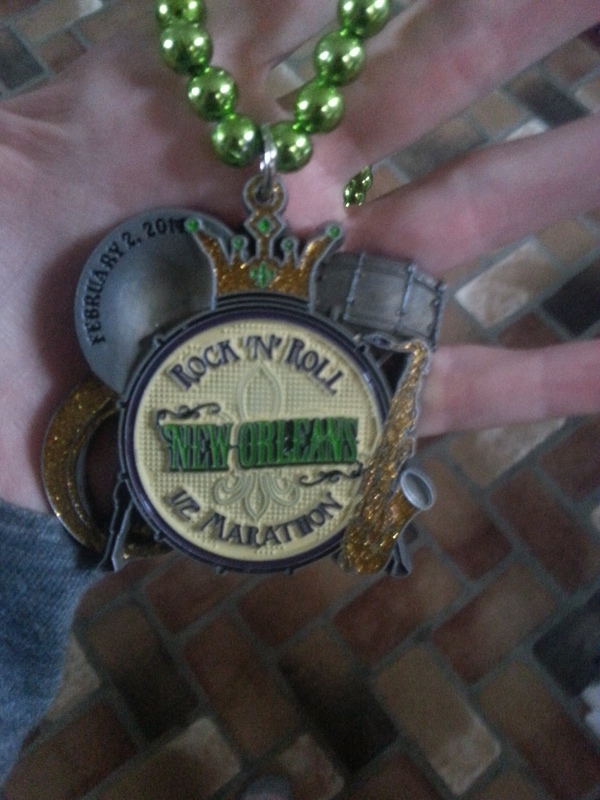 This weekend I had a lot of running friends run the 2015 New Orleans Rock ‘n’ Roll Marathon and Half Marathon. 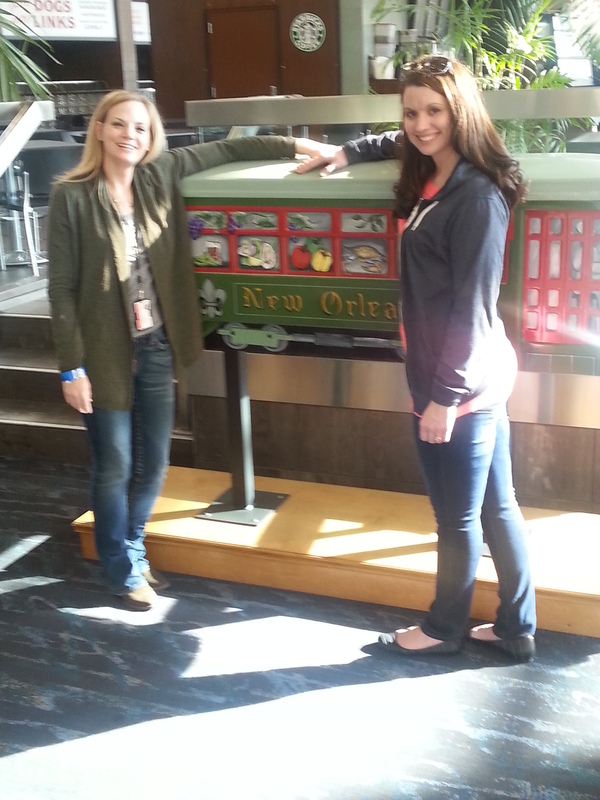 I loved seeing all of their expo, “flat runner”, tweetup and finish line brag pics! I didn’t sign up to run it this year because I didn’t feel like I would be ready to run it in time and didn’t want to put that kind of pressure on myself after the arrival of Baby Z-peat. I really just wanted to soak up my time with his sweet little face. But, I ran it last year. I never did a race recap on it. I thought it’d be fun to post a race recap one year later. Let’s see how much I remember! This race was just doomed for me from the start. Everything that could go wrong did. I had every intention of running the full marathon that year. 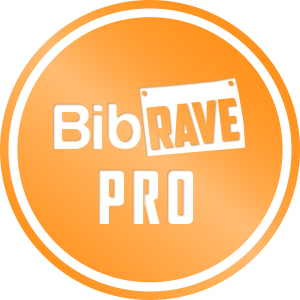 I trained hard all fall and PR’d a couple of my half marathons leading up to the race. I was feeling strong late December with two 20 milers already under my belt. Things were looking good. And then Christmas happened and then I got the flu. Ugh. I was sick for over two weeks. When I finally started to feel better my body was so incredibly weak. Two weeks before, my friend Nicole was running the full too. It was going to be her first. She wanted to come over to my ‘hood to run with me for her last long run for a change of scenery. It was going to be a test run for me to see how my body would do. If I could manage the whole 20, no matter how slow, I would run the full. If not, I would downgrade to the half. We started our run and 6 miles in I just was not feeling it. I knew then that this run would be a real struggle for me. I stuck it out for 12 miles and then had to call it quits. I felt so bad for having to leave her to finish out those last 10 miles but I just couldn’t go any longer. (She rocked those last 10 miles anyway!) My body was spent. My dear friends Sarah and Ryan were coming in for the race and I was so excited to see them! Mr. Z, Little Z and I met up with them the Saturday of the expo and had lunch before heading over to the expo to pick up our packets and peruse the running goodies. Funny enough, this is where I bought my first FlipBelt and fell in love with it. I was nervous though. I was supposed to run the full with Sarah and I was still feeling pretty crummy. To add insult to injury, Mr. Z was supposed to run the half. That same week he started having severe nose bleeds…to the point he had to go to the ENT to have a blood vessel cauterized. The Dr. told him under no uncertain term was he to run for 4 weeks or he could risk hospital stay. So, he was out. I convinced my friend Kerrie to come run on his bib with me. She’d been having some calf and shin pain but I twisted her arm and she relented. Yay! Sunday morning I got up, still feeling crappy and exhausted. I had NO energy. My body felt beat down and tired. I had decided that I was just going to shuffle through the half and get it done. I’d paid my entry. I was going to get a medal one way or the other dammit! I walked out the door to my car and was greeted by crazy, thick-as-pea-soup fog. FOG! UGH! Seriously? Kerrie and I were following each other across the bridge. When I got to the toll booth, I saw that they were caravaning people across at 35 mph due to the thick fog. 24 miles at 35 mph. Seriously????? Ugh! Luckily we had given ourselves plenty of time to get across, get parked, catch the shuttle, and meet up with Sarah. We were doing good on time. We finally got across the bridge and the fog had lifted a bit. We got parked and were gearing up to go catch the shuttle to downtown. I couldn’t find my headphones. I tore the car apart. No headphones. Damn. Not a huge issue since I run without headphones most of the time but I like to put them in if I start really struggling or hurting for an extra bit of motivation. 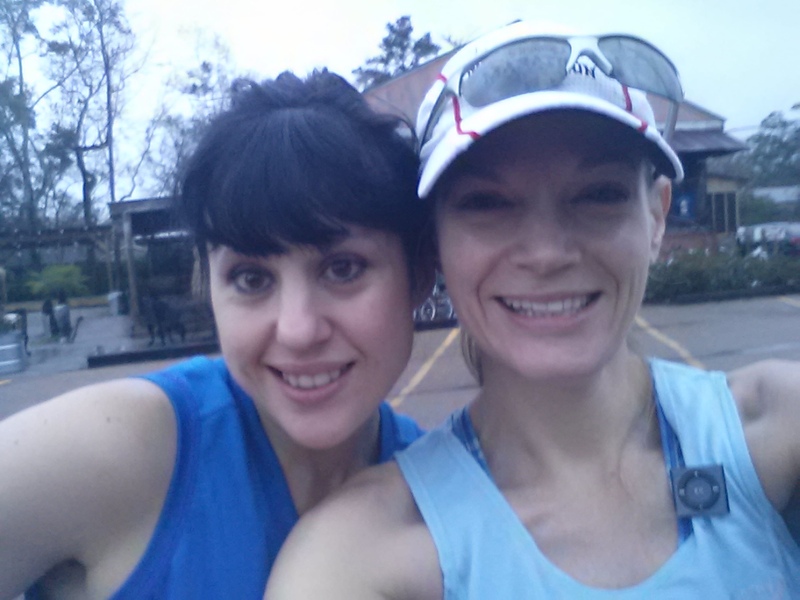 Kerrie and I always talk our heads off while running so It was OK. We started to walk to the shuttle buses and I had a nagging feeling in my head that I was missing something. I felt for my car key and it was gone. GONE!! I started to freak out. Kerrie, (thank God for her level head) ran back to car and looked for the key using her iPhone light (it was still dark out). We were hoping I had just dropped it at the car. I began to backtrack behind her looking as well. No key. Anywhere. I thought maybe I had just locked it in the car while rummaging for my headphones. At this point I was feeling crappy, exhausted and freaked out over losing my car key. We decided to say “F it” and just run the damn race since we were so close. After all that, we were cutting it close for the race start. We caught one of the last shuttles to the start line and managed to still make it to our corral. Unfortunately I completely missed seeing Sarah at the start. We slowly meandered our way to the start line and I was still a stress ball and nervous wreck over losing my car key. We got to the start and began running. We were off! About a mile in I ran into Nicole and Karen! I snuck up behind her and goosed her. HA! She was looking strong and ready to tackle all 26.2 miles! Our motto was to just keep moving/shuffling/walking until we crossed that finish line. The miles ticked by. I’m so grateful for Kerrie’s conversation and taking my mind off things. Before I knew it we were halfway done and in the French Quarter. 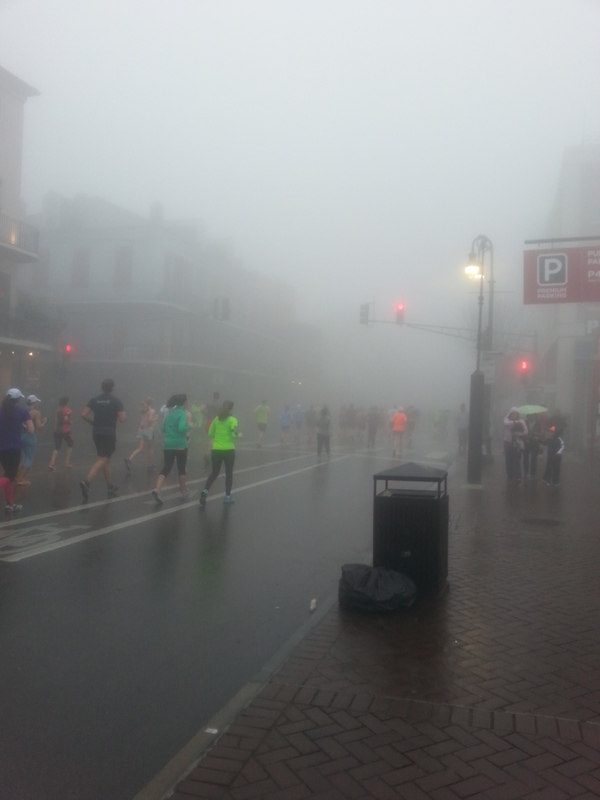 It was CRAZY foggy in the Quarter as we got close to the river. It was very eerie and actually quite beautiful running through it. By mile 8 we were hurting. I still felt crappy. It was taking every bit of willpower to run and keep moving. I had zero energy. What was wrong with me? 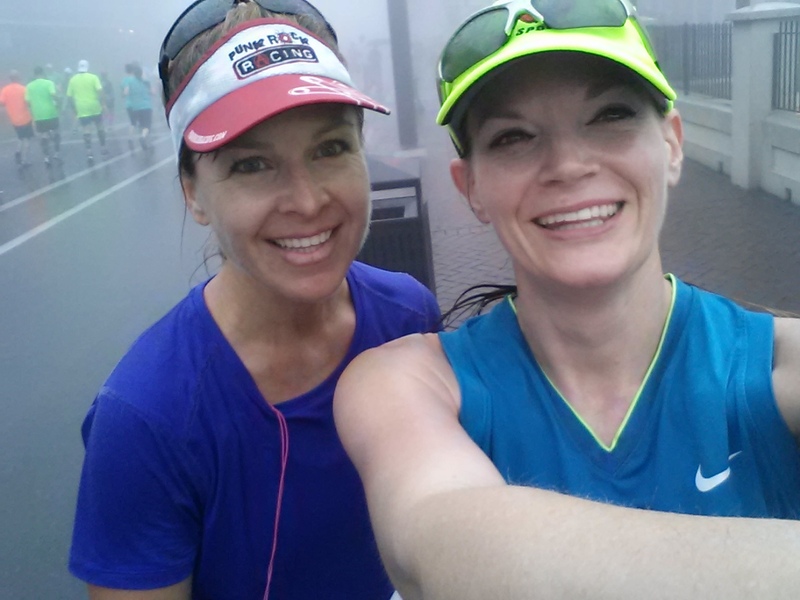 I was running 16 and 18 milers just a few weeks before with no issue! But we kept it fun and silly and just kept moving, moving, moving. The last few miles were a blur. I just remember entering City Park and wanting to be done so badly. Just keep moving. Just keep moving. I finally saw the finish line and it was such a wonderful site. We were almost there. Kerrie took off in a sprint. She wanted to be done. I didn’t have any gas left. I just kept moving slowly to the finish line. We. Were. Done. We got our finisher medals and walked back to the car hoping maybe we might see the key along the way or dropped right at the car. Nope. Nothing. Nada. Fuuuuddddggggeeeeee. I call Mr. Z and told him I had lost the key. He was so wonderful and drove across to bring me the spare key. We walked over to CC’s and had some warm coffee (I ALWAYS pack a credit card or a $20 in my belt for those “just in case” times thank God!). We waited there until he arrived with the key. Hallelujah! I drove home, got a hot shower and crawled into bed for a long nap. All morning I was telling Kerrie that something was off. This was not me! I’m not this scatter brained! I just was not feeling well. No energy. Exhausted. Well, a week later I found out why!! 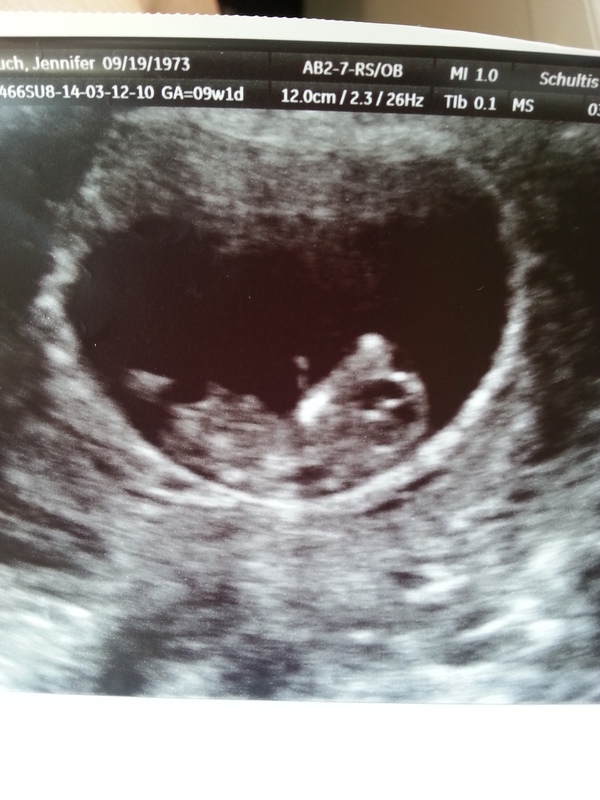 I was pregnant with Baby Z-peat! No WONDER! I can honestly say this was one of the craziest, messed up races I have ever done. I have no idea how I made it through it but I did. Amazing what a little willpower and good friends can do! so crazy!!! that’s how I felt running tinkerbell right before I found out about EK. I was SO exhausted and just blamed it on running dopey the week before then flying across the country.! Awwwwwww you had another little runner on board! No wonder it was such a struggle bus. I didn’t start running until after B was born, but there would be no way I’d be running a half marathon feeling the way I felt during my first tri.